My life made a turn after I read the books written by P. D. Ouspensky. Not happy with my understanding of life, I was already searching for some years. But none of the scientific, religious and esoteric ideas that I had encountered could satisfy the unexplained longing in me. Reading Ouspensky felt like coming home. Ouspensky was a student of Gurdjieff, and the ideas that they taught are known as The Fourth Way. The essence of The Fourth Way is a technique called Self remembering. It is the separating of ones attention, meaning being both aware of one’s outer and inner life at the same time, and under all circumstances. To remember oneself is very difficult. Ouspensky wrote that about two minutes is the limit; but usually people forget to remember them selves within seconds, no matter how hard they try. Self remembering was exactly what I was searching for, although I had no idea that it existed before I read about it in In search of the miraculous , the classic book in which Ouspensy describes his encounter with Gurdjieff and his ideas. Although I read every Fourth Way book that I could find, and there are libraries full of books that are labelled as such, and although I did find useful and fascinating information, I was basically only interested in trying to selfremember and the possibility of awakening. I had no idea what “waking up” meant, but like many people the idea attracted me like a magnet. Selfremembering turned out to be impossible for me, apart from very short moments, that I did not really “do”, but that happened to me. I was already beginning to loose faith in the possibility of awakening, when one night in 2000 I ate a bit too much hash and, after having had an exteremely bad trip that lasted several hours, I remembered my real Self. It was so completely different from anything I had expected, imagined or heard from others, that it took me years to come to terms with it. It was Selfremembering that helped me through the difficult periods of knowing that I was no longer what I had always thought to be and not knowing how to be what I now knew that I really was. If what I say here sounds mysterious or incomprehensible, I am very sorry, but I don’t know how to say it more clearly. I have written piles of letters and diaries on all this, but nothing is worth publishing. If I imagine myself to be 19 again, I can only hope that I will find In search of the miraculous In stead of one of my own writings! 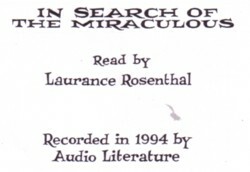 A few years ago Rob van der Meer gave me a cassette with an abridged version of In search of the miraculous , read by Lawrence Rosenthal. Of course the book is better, but I love that tape too. Since that tape Ouspensky talks to me in my mind with the voice of Lawrence Rosenthal. I have never heard Ouspensy’s voice, which I imagine to be much higher and more nasal than the warm and deep voice of Lawrence Rosenthal. I still hope that one day I will get to hear Ouspensky’s voice, but I don’t mind that till that day I will have to do with the voice of Lawrence Rosenthal. (continuing last entry) because I was simultaneously in touch with two influences—reality and whatever was cutting me off from reality. i’d be very interested in corresponding with you more about this. Thank you sharing this.